We all know that Samsung and Sony are titans. Both companies have produced a wide variety of high-quality products, including mirrorless cameras. In this chance, we are going to discuss the differences and comparisons between their products, Samsung NX30 and Sony a6000. The two models are available at similar prices on the market. Samsung NX30 is famous for the very powerful performance, coming from the Samsung NX series of smart digital mirrorless cameras. On the other hand, Sony a6000 is often considered as the jack-of-all-trades among photography cameras in the class. Which one should you choose? In terms of design, the two products are already quite different. Sony a6000 is loved by many for the slim, compact, and lightweight properties. Being so compact and portable, it is very easy to bring along. It is rather simple in design, with a rectangular shape and featuring the classical but reliable dial control. The display screen is tiltable, giving you some edge for difficult shooting angles. On the other hand, Samsung NX30 is rather hefty. The model is certainly bulkier and slightly heavier. However, it features touchscreen control. Plus, the display screen is tilt-swivel, allowing you to shoot with even more flexibility. If you use your digital mirrorless camera for video quite often, then Samsung NX30 offers some useful features here that Sony a6000 lacks. First, Samsung NX30 comes with an external mic jack, allowing you to capture high-quality audio recording. Second, Samsung NX30 has the function to record slow-motion videos, allowing you to make more creative works. Another thing to note is that Samsung NX30 has built-in Wi-Fi, allowing it to be compatible with various smart functions such as social media upload, direct link, mobile link, and also Remote Viewfinder Pro. 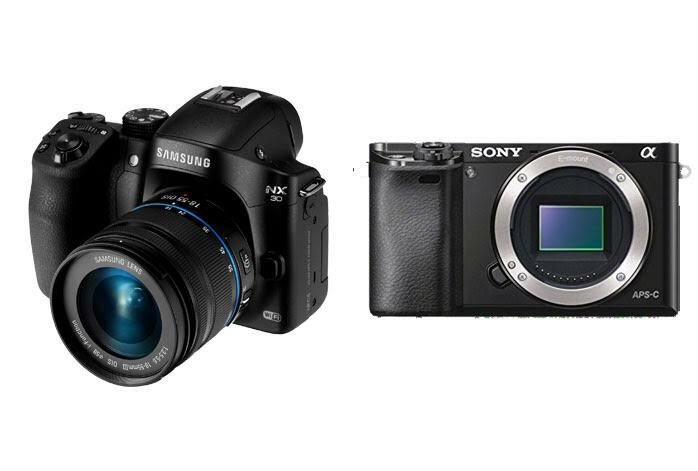 In terms of performance and output quality, however, Sony a6000 has a much better edge than Samsung NX30. Indeed, Samsung NX30 has a near-instant startup of only 0.80 seconds, and also a faster maximum shutter speed of 1/8000s. However, Sony a6000 comes with more strengths in the other aspects. First of all, Sony a6000 comes with a more powerful image sensor, 24MP APS-C CMOS. It has a higher maximum ISO of 51200 and a better low-light ISO of 1347. As the effect, it can effortlessly capture images with better sharpness and more accurate colors. The continuous shooting speed is also better, as Sony a6000 has an 11fps photo burst. If you use your camera only for photography, Sony a6000 is the way. It has better image quality. However, if you also use your camera for making videos, then you may prefer Samsung NX30 for the external mic jack.